Michael Oravitz places a tray of integrated circuits into an X-ray Fluorescence Spectrometer to determine the lead content of the solder. If the content is less than the required 3 percent, the spectrometer will alert him. Solder that has less than 3 percent lead can develop "tin whiskers" that can damage a circuit, rendering electronics systems unreliable. Oravitz is an electronics technician at Tobyhanna Army Depot. ARLINGTON, Va. (June 11, 2010) -- The U.S. Army is using an X-Ray Fluorescence Spectrometer, or XRF, to scan electronic components and circuit cards as part of an effort to improve the reliability of electronic systems by reducing the percentage of materials that are lead-free, service officials said. Lead-free electronic components, used increasingly in the commercial electronics market, can decrease the longevity and reliability of electronic systems and lead to the formation of damaging "tin whiskers" -- small, protruding hair-like strands which can damage the functionality of electronic systems and cause circuits to "short." "Consumer electronics are designed to have a life span of three to five years. When you are done with the device, you throw it away. Military systems are not designed for a three-year life span -- they are designed for a 30-year life span," said Ray Rowe, electronics engineer, Tobyhanna Army Depot, Pa. In 2006 the European Union enacted the Restriction of Hazardous Substance Directive, or RoHS, which prohibited the use of lead and other substances in electronic components; it is a green initiative designed to reduce lead-contamination from materials such as televisions and cell phones when they are discarded, Rowe said. Although the military is exempt from RoHS, it is becoming increasingly difficult to acquire electronic components that are not lead-free. "We have a requirement to use commercial off-the-shelf devices. The manufacturers' revenue comes from consumer electronics because that is 98 percent of their market share. There is not enough demand for them to run a separate production line for traditional lead components," said Rowe. In short, it has become more difficult for the military to find more available and affordable ways to continue using traditional tin-lead or Pb solders and finishes. The XRF scanning technology is used to examine semi-conductor components destined for use in everything from small radios to 60-foot satellite communications systems; it is able to determine the amount of lead content in a particular electronic component such as a capacitor, transistor or circuit board. "The XRF is an instrument that measures the material content of electronic components. We are doing this screening at a depot level. This type of screening should be done upstream in the supply chain so that we are not the first to identify lead-free components," said Don Engel, chief of the Process Engineering Division, productivity improvement and innovation, Tobyhanna Army Depot. 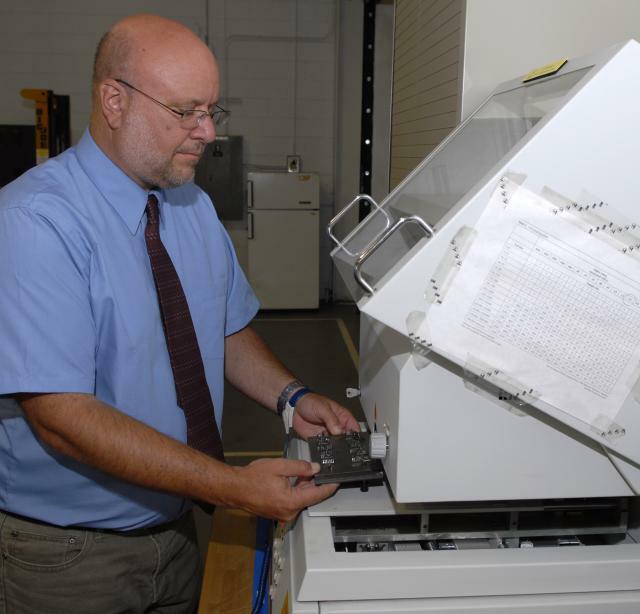 In 2007, the Army began a demonstration-evaluation of XRF scanning technology at Tobyhanna Army Depot -- working with Concurrent Technologies Corporation -- as a way to identify and subsequently decrease the percentage of lead-free components acquired for military electronic systems. "Due to the thousands of components that we buy every year, it is a significant problem that we must address and correct. Our folks have taken the initiative to set up a screening and testing process to alleviate any potential problems," said Frank Zardecki, deputy commander, Tobyhanna Army Depot. When the XRF determines that there is less than 3-percent lead in a given component, that is an indication that it is lead-free. Then, lead is added to the materials. "At that point we would want to re-tin the solder. Initially this was done manually. Recently we procured an automated soldering station which will allow us to re-tin a number of components at one time," said Engel. The re-tinning process, called "remediation," is aimed at increasing the reliability of electronic components and removing the risks associated with the use of lead-free materials. The idea of remediation is to take the lead-free solder off of those components and re-apply a lead-based solder. "We want to provide assurance that equipment will not experience failure due to tin whiskers," said Rowe. The difficulties surrounding the growth of tin whiskers is compounded by the fact that there is not a known length of time or set of specific identified conditions which cause them. "Tin whiskers can cause a short circuit. Academia and industry have done research of how tin whiskers occur and the answer is not there yet," said Gino Spinos, senior technology demonstration scientist, CTC. Nevertheless, the XRF scanning at Tobyhanna Army Depot has proven worthwhile in reducing the percentage of lead-free electronics acquired by the Army. "What we found at Tobyhanna in 2007 was a 30-percent non-compliant rate for materials coming in to the facilities. Since that time frame, we are currently seeing about 12-percent non-compliant materials as a result of utilizing XRF and implementing different procedures to prohibit lead-free materials from coming in," said Spinos. An XRF spectrometer demonstration-evaluation effort is also underway at Fort Rucker, Ala.
Also, Army planners are hoping to raise awareness regarding the dangers of lead-free electronics through extensive education and training programs. For instance, Tobyhanna Army Depot uses a special data base compiled to provide information on lead-free materials called the Lead-free Surveillance and Analysis System. LSAS is a web application--put together by the National Defense Center for Energy and Environment -- which catalogues information about electronics such as their elemental composition and thickness, etc., along with details about the number of components scanned by XRF spectrometry. "The NDCEE has been a leader in identifying and assessing the true nature of the Pb-free supply chain challenge so it can be effectively managed and risks can be mitigated. While there is much more work to be done, I am proud of the Army's accomplishments to date as well as the contributions of the NDCEE in addressing this critical issue," said Tad Davis, deputy assistant secretary of the Army for Environment, Safety and Occupational Health and Department of Defense Executive Agent for NDCEE. In addition, the Defense Acquisition University will launch a website in several months aimed at educating and raising awareness about the issue. The Army is in the early stages of articulating a lead-free electronics policy which aims to capture lessons learned from the progress at Tobyhanna and implement a set of procedures across the service.